Southern New England loves Chinese buffets. I don’t know if it’s the low price or the selection of food that keeps the people coming, but in my opinion, Peking Garden is one of the best. Actually, it may even be the best. Armed with our $10 gift certificate from MenuJoy.com, Mom and I pulled into the small parking lot at 3:15 p.m.
As always, Peking Garden was busy. It wasn’t super busy, but there were enough people scattered throughout the Asian-themed restaurant to make it difficult for me to get a picture of the steam tables. Sorry fans! You’ll have to deal with whatever shots I was able to sneak. Mom and I were greeted at the desk by a waitress who took us to a table. She took our drink order – two Diet Cokes – and disappeared to retrieve them. Mom and I started to head up to the buffet tables, leaving behind everything but our wallets in order to “claim” our table. 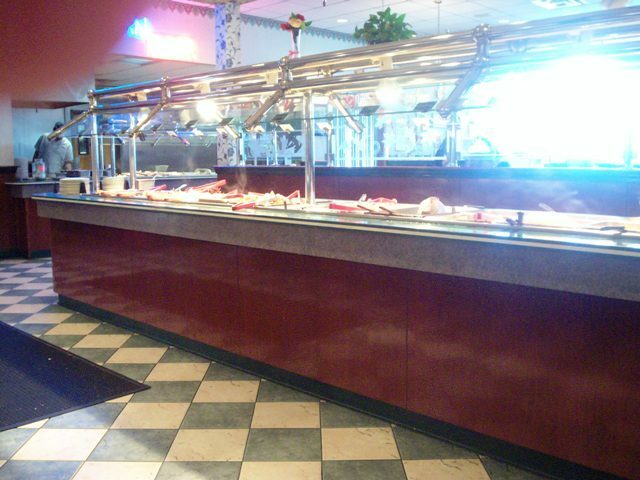 Peking Garden has – by far – the largest buffet in the area. There are just so many things to choose from! There are several different versions of chicken – General Tso’s, lemon, peanut butter, pepper (a favorite of my dad’s), and the standard chicken finger with sweet and sour sauce. They have a Mongolian Bar, where you can choose your meats, vegetables and sauce and have your meal cooked to order. 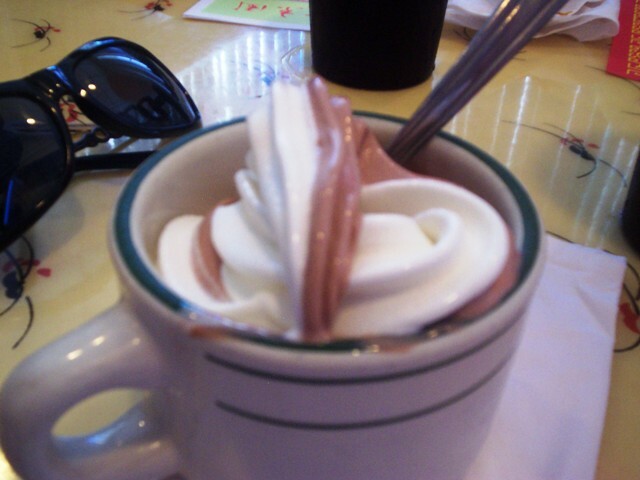 They also have American-style sushi, soft serve ice cream, several different desserts like cream puffs and candied nuts, American foods like pizza and French fries, and everyday Chinese favorites like teriyaki steak, lo mein, sautéed mushrooms, chow mein, wonton soup, crab Rangoon, fried rice, crab legs and those soft, sugary buns often called “Chinese malasadas”. We usually make two trips to the buffet, with our second plate much less filled than our first. I think that’s generally what happens with everyone. Once you fill up on whatever you chose on your first run, you’re pretty much only going to go back for seconds on whatever you really enjoyed. That’s why the first plate is the most important because it contains all of the things that you either love, aren’t sure of, or have wanted to try. Of course, in this case, we forgot to take pictures. I think we were just so overwhelmed by the freshness of the food that we dug in and forgot all about New England Bites. Oh well, here’s what we had: Mom had a small bowl of chow mein with gravy, a few chicken wings, and General Tso’s chicken. I had stuffed mushrooms, steamed dumplings, crab Rangoon, a sugary bun, sesame balls, and lemon, peanut butter and General Tso’s chicken. Everything was so delicious and fresh. The sesame balls were a surprise because they had a sweet paste inside which was a lot tastier than I expected. Mom’s plate disappeared almost as fast as mine did, and before long, we were on our feet for round two. This time I actually remembered to take out my camera. 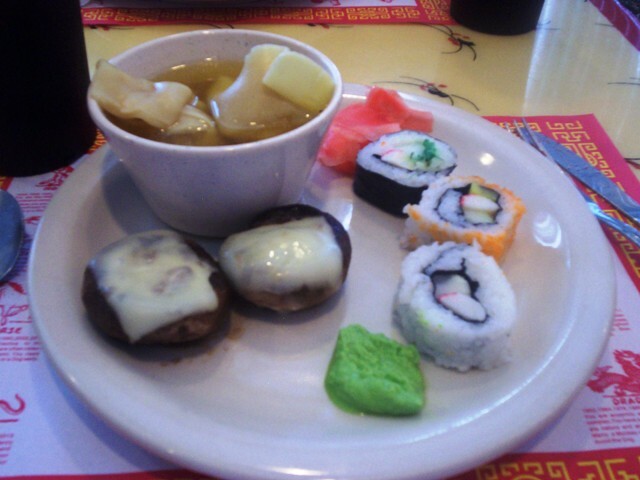 I had the sushi, wonton soup and more stuffed mushrooms (they were especially delicious today and I couldn’t leave them alone). I also made sure to get some wasabi and pickled ginger for my sushi. Mom chose peanut butter chicken, mashed potatoes, a chicken finger and a bun. She said that everything was fantastic, but this is always the case with Peking Garden. We’ve been coming here for years and have never had anything bad to say. 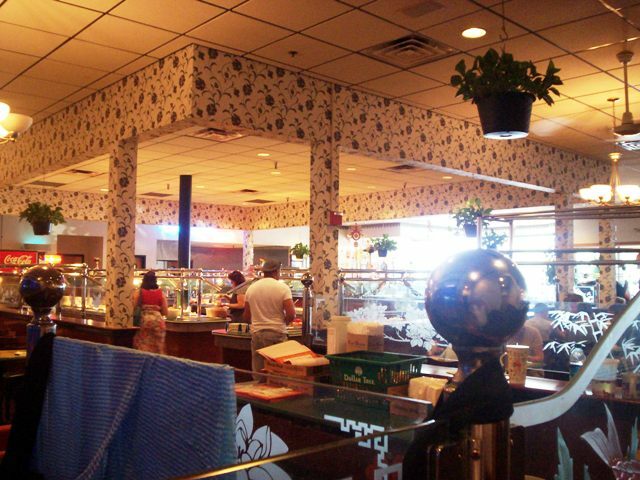 I also know that a lot of our fans visit Peking Garden frequently and always rave about it. As for my sushi, it was great! Now I’m not a sushi connoisseur, and I really don’t know much about it, but these rolls consisted of rice, crab, vegetables and seaweed. They were really fresh and the intense wasabi definitely added a kick. The pickled ginger, on the other hand, was sweet and brought that kick down a notch to even out the taste. Whomp, whomp. There's no room at the inn for you, General Tso! At this point Mom and I were pretty much done with our lunch and decided to get some ice cream before leaving, however, I made a sad attempt at a third plate. I grabbed two more stuffed mushrooms, some sautéed mushrooms (I definitely had mushrooms on the brain), a mozzarella stick and one lonely piece of General Tso’s chicken. 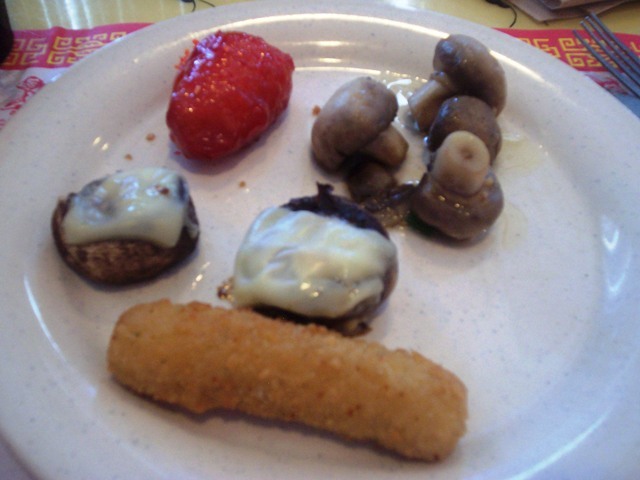 When Mom and I met back up at our table, she was surprised to see that I had gotten another plate. I just couldn’t keep away; the food was just so good. *It actually came to $26.78, but I guess they rounded up. Now I wasn’t sure if the Cokes were factored into the total, because a sign on the table told us that non-alcoholic beverages (including fountain drinks) range between $1-1.50. By looking at the bill, I guess that drinks are included. Also, we paid the dinner price because we arrived after 3 p.m. Had we come in before 3, we would have only paid $8.95 plus tax for lunch. We left $32.40 on the table for our waiter which included a 20% tip, even though we pretty much served ourselves. It was a good deal because we had that $10 gift card, so we really only paid $22.40. What’s better than a good meal? A good meal that you didn’t have to pay full price for. 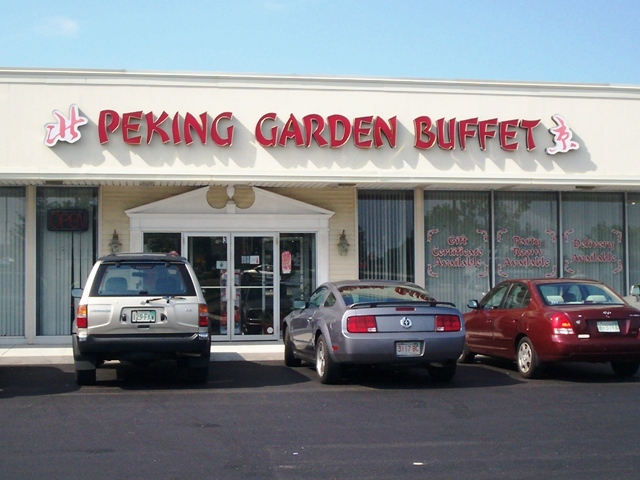 Peking Garden also has a regular menu, but we’ve only ever gone to the buffet. Why settle on one thing when you can choose whatever you want all for one price? With that being said, I’m sure their other food is fantastic because everything has always been top notch. Click the link above to view their full menu courtesy of MenuJoy. Will we be going back to Peking Garden? Absolutely! I have to go back and get my mushroom on. I couldn’t get enough of them, along with everything else. No wonder this restaurant draws such a big crowd! Peking Garden Buffet is open from 11 a.m. to 10 p.m. Monday through Thursday and Sunday, and 11 a.m. to 11 p.m. Friday and Saturday. The weekend lunch buffet is $8.95, while the weekend (plus Friday) dinner buffet is $12.60. The weekday lunch buffet (Monday though Friday) is $7.95, and the weekday dinner buffet (Monday through Thursday) is approximately $11.60. PS - Be careful what you order if you are one of the people that like to show up early to get the dinner food for the lunch price. A table of women on the side of us ate crab legs, which is apparently a dinner item. Even though they arrived before 3 p.m., the one who ate the crab legs still had to pay the dinner price. The woman was not happy about this, and although I did not see any sign stating this rule, I may have missed it. Also, the staff seems to be a little concerned about the bill. They’ve been known to “hover” at the table to make sure that you pay. I’m sure they’ve gotten stiffed in the past, and that’s a shame. Stop ruining it for everyone else, thieves!